Our range of products include Wooden Jewellery Box such as Wooden Jewelery Box With Metal And Cloth Work, Jewellery Box, Wooden Jewellery Boxes, Jewelery Box, Wooden Jewelery Boxes, Jewellery Boxes and many more items. 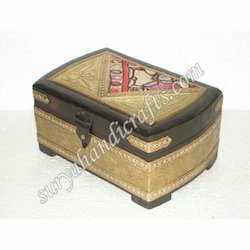 Wooden Jewelry Boxes offered are widely demanded by clients for keeping the jewelry items and can be offered in various colors and design choices to pick from. Being mainly used for keeping jewelry or other precious items, these are ideal choice for gifting purposes and come designed from high grade wood material to achieve durable and smooth finish appeal. Some of its features include available in termite resistant treated finish, beautiful crafting and shiny finish, also available in different sizes and designs as per choice of customers, perfect to be used for functional as well as decor purposes.